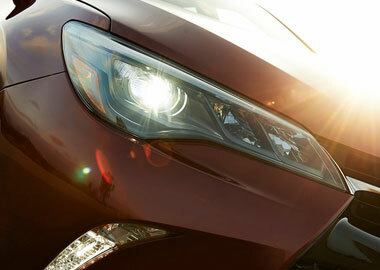 Camry Hybrid knows how to balance power for fuel efficiency. With Hybrid Synergy Drive®, the combined output of both the gas and electric motors is an impressive 200 hp. And because of its advanced design, lightweight materials and refined aerodynamics, you can go farther for less. 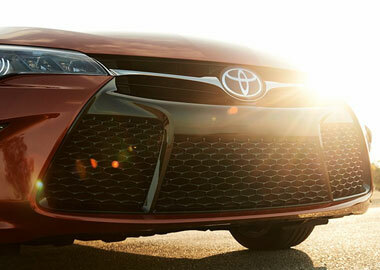 Camry Hybrid provides the tools to help you get the most efficient drive. The energy monitor displays the gas engine, the electric motor generator and hybrid battery. As conditions change, it provides real-time information showing how power is being routed to the drive wheels, or how the battery is being charged. The most important connection is the one with the road. Camry Hybrid uses advanced tire technology to increase inflation pressure, reducing tire rolling resistance and improving fuel efficiency. Camry XSE comes standard with all-new 18-in. alloy wheels. With their gloss-black finish and machined-face accents, get ready for stares. LE and XLE’s spacious cabin features rich wood-grain-style accents at key touch points to further enhance your driving experience. Start it up and go. With Camry’s available Smart Key System, you can unlock the front doors and trunk, plus start your car with the push of a button—all without removing the key fob from your pocket or purse. Technology to make life easier. Available Entune™ Premium Audio with Navigation and App Suite gives Corolla the tech you crave. Its 6.1-in. touch-screen display, backup camera, navigation and suite of apps help you stay connected. Keep track of the driving information you use most with Camry’s available Multi-Information Display. Easy to view from any angle, this customizable full-color screen shows features like incoming call information, available turn-by-turn navigation, current fuel economy, available Dynamic Radar Cruise Control (DRCC) and more. 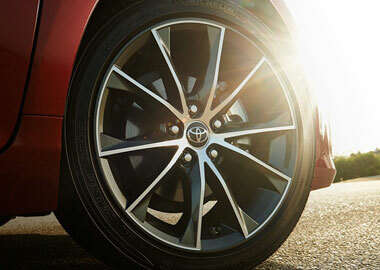 A Tire Pressure Monitor System (TPMS) comes standard on every new Camry. The newly available Multi-Information Display shows the tire pressure for each individual tire. And should a tire or tires become critically underinflated, the system alerts the driver as to which one is low on air.